Rivers State Governor, Nyesom Wike, has said the consistency with which the police sabotaged the electoral process in the state amounted to a declaration of war on the people. Wike, in a state broadcast yesterday, on the botched Port Harcourt constituency 3 by-election, urged Rivers people not to succumb to the antics of the police, lest they become slaves in their fatherland. Wike said: “Clearly, there are dangerous times ahead. But, we must not give in to intimidation, lest we lose our liberties and become slaves in our own land. The governor said despite assurances from the state Commissioner of Police during the last security council meeting that the police would remain neutral and act professionally, the police, on Saturday, joined forces with the All Progressives Congress (APC) thugs to disrupt elections. He said: “As we had feared, the police failed us completely once again and negated all that they promised. Instead of providing security for voters and Independent National Electoral Commission (INEC) officials, the police brazenly colluded with political thugs of the APC to subvert the democratic process and denied the people of Port Harcourt Constituency 3, their rights to free, fair and credible elections. “Confirmed reports from the field indicated that INEC promptly and rightly distributed election materials to all polling units within a recorded time. “However, while voting was underway, armed thugs from the APC moved freely from one polling unit to the other, violently assaulted voters and INEC officials and carted away election materials, including smart card readers and ballot boxes. 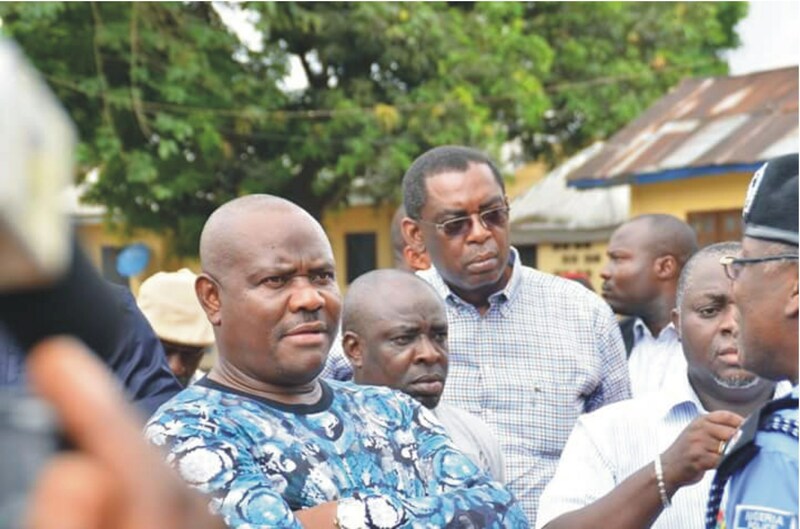 “It is important to note that Amachree, who led the thugs, is the same person facing multiple murder trial and instead of arresting him, as ordered by the trial court, the police have continued to aid and shield him from arrest and prosecution,” Wike said. He noted that during the June 16, 2018 local government election, where APC refused to participate, the polls were conducted peacefully without rancour. Wike said the disruption of the Port Harcourt constituency 3 by-election was not the first time the police would be indicted for unconstitutional anti-democratic action during an election in Rivers. While the governor commended INEC for acting professionally, he berated the police for taking sides and offering illegal aid to APC to undermine electoral process in the state. Meanwhile, Presidential aspirant of the People’s Democratic Party (PDP) and former Kaduna State governor, Ahmed Makarfi, has called on President Muhammadu Buhari to intervene and stop the security siege on Rivers state. “President Buhari holds it a responsibility to Nigeria to call such persons to order because nobody is beyond being called to order,” Makarfi said. The PDP presidential aspirant, who made the call while speaking with newsmen in Kaduna, yesterday, said if such official was not called to order, it was capable of causing havoc to Nigeria’s democracy. “I watched a video of the the Resident Electoral Commissioner (REC) in charge of Rivers State, where he said the security agents responsible for the crisis were not those engaged to secure the election process. “If it is true that certain individuals were going round polling units with platoons of security men unchallenged, then the president should do something, because that is injurious to our democracy,” he said. On his part, Ekiti State Governor, Ayodele Fayose, alleged that the by-election was another sad pointer that votes of Nigerians would not be allowed to count at the 2019 election as the elections will be held at gun-point to achieve predetermined results. He called for the arrest and prosecution of the policemen who took part in the shootings and snatching of election materials. However, Rivers State chapters of the PDP and the APC, two political parties, which were major contenders for the state House of Assembly vacant seat, have accused each of perpetrating the massive violence that marred the poll. PDP state Chairman, Felix Obuah, in a statement, yesterday, in Port Harcourt, accused a faction of the APC, of violently disrupting the election. Obuah condemned the activities of the APC faction, alleging that the state opposition party used armed thugs to cart away electoral materials, including result sheets. Similarly, APC said it had noted with disappointment, the hasty decision of INEC to suspend the process at the collation stage. APC state Publicity Secretary, Chris Finebone, said: “It is unfortunate that what should be a mere state constituency by-election witnessed pockets of voters’ intimidation, harassment, vote-buying and shooting activated by the PDP in line with their usual character of rigging elections through killing and maiming of APC members. “It is worthy of note that security agents gallantly rose to the occasion and effectively quelled the pockets of violence that threatened the exercise in some wards in the constituency, leading to the eventual collation of results at the St. Andrew’s premises.